Have you ever came home from your favorite art supply store, after the “mother-sale-of-them-all” and wondered where you were going to stash your new goods? How can you ever get all these art supplies organized? We all know there will be no beautiful art without canvases, sketchbooks, and paper. 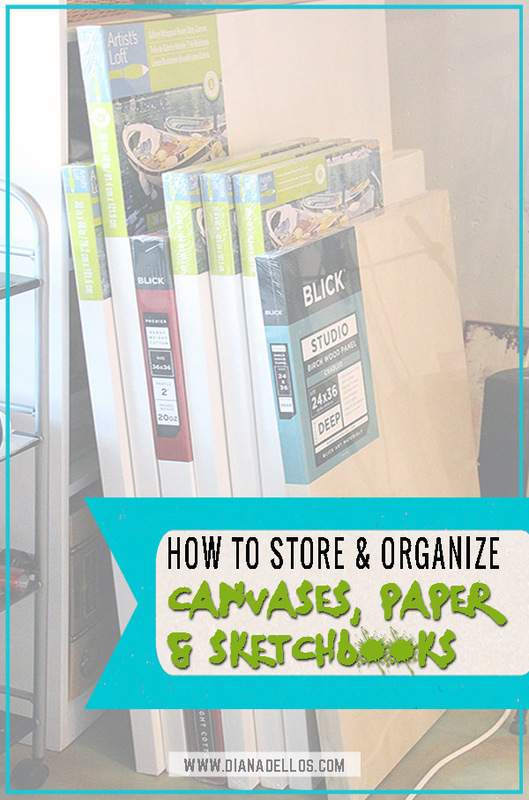 Storing and organizing your art canvases, paper, and sketchbooks can be easy and decorative too! When your mom owns a framing gallery (mine did), you learn quickly that large art pieces always get stored vertically! The chance of damage is too great if they are stacked on top of one another horizontally. In my first art studio, which was a converted garage space, I kept my canvases off the floor with 2×4 wood scraps and stacked them vertically in about three different areas. The reason to keep them off the floor is because there is always the inevitable flood from the water heater breaking or the accidental coffee mug to the floor. Many canvases have been ruined because they sat in liquid for too long! When I first bring home new canvases, they typically get stacked like this until I make room on my storage bin. If you store them like this permanently, just remember to lift those babies off the floor with some scrap wood pieces. The longer I painted, the harder it became to organize my art supplies. After years of having stacks of canvases all around my studio, I finally decided to have a custom-built storage bin to store my canvases and wood panels. I did some research on Pinterest and found some ideas that would work for the sizes that I liked to paint on. I sketched out a plan and gave it to our handyman to build. It think it cost me around $600. I chose to make my storage bin 4ft wide x 6ft tall. The bottom vertical bins are 4ft tall, while the top vertical bins are 3ft tall. This allows me to store various sizes of art supplies and keep them all organized. I have wood panels, thin canvases, and thicker canvases in these. In between the two vertical storage bins are my long and flat shelves. 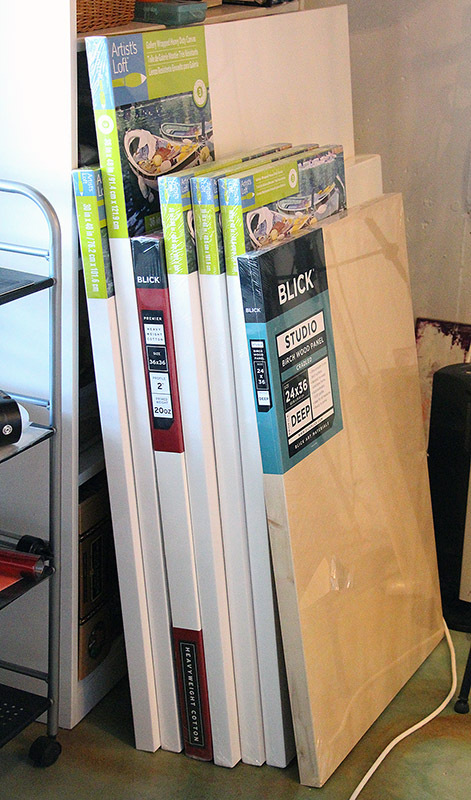 I wanted two horizontal shelves for my large paper and work-in-progress pieces, so these are 3ft wide. Lastly, the long vertical bin on the right is for all those oversized pieces that never fit anywhere. One of my favorite things about it is that it’s on strong casters, so I can wheel it around easily. If I were to do it over again, the only thing I would change is to have two of these art bins! It’s full and I still have canvases stacked around my studio. Ha! If you have the room, go for it! Storing and organizing large paper pads can be a challenge. I’ve seen several photos on Pinterest that show artists using old drafting drawers for their art paper. Great idea if you can score a vintage piece like these! I designed some long horizontal shelves in my custom-built storage bin just for this purpose. 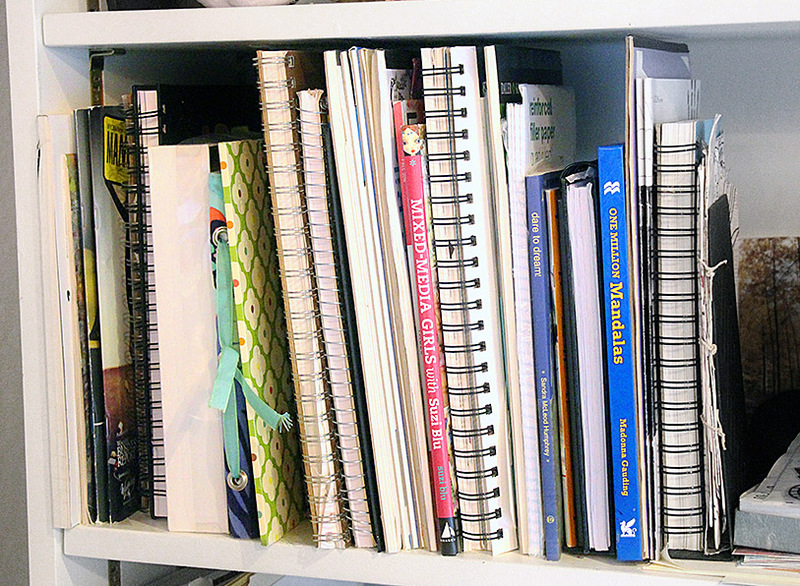 Other ways I’ve kept large paper pads in good shape is to store them on top of a shelf or cupboard and cover with fabric or plastic to keep the dust off. 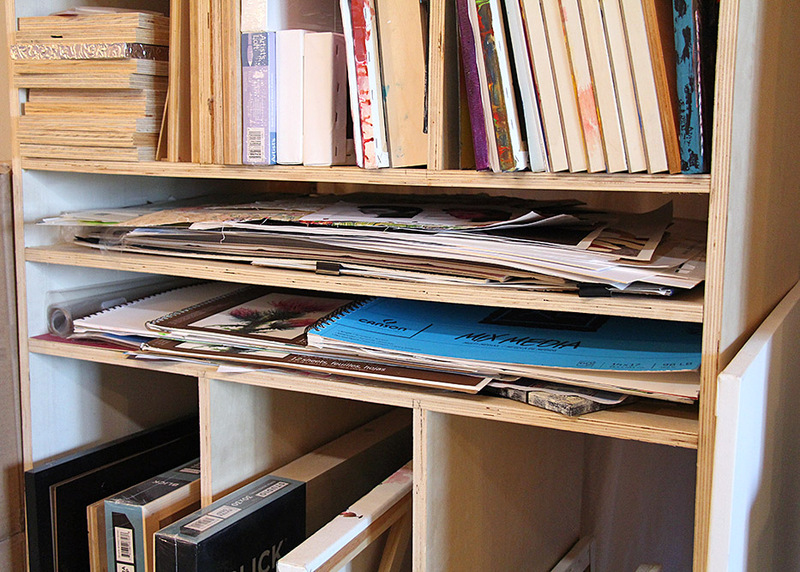 Smaller pads of art paper can be stored on a shelf, vertically. I like to keep all of mine together so I know where to go for all my paper. I have tracing paper, drawing paper, mixed media paper, and watercolor paper all together. 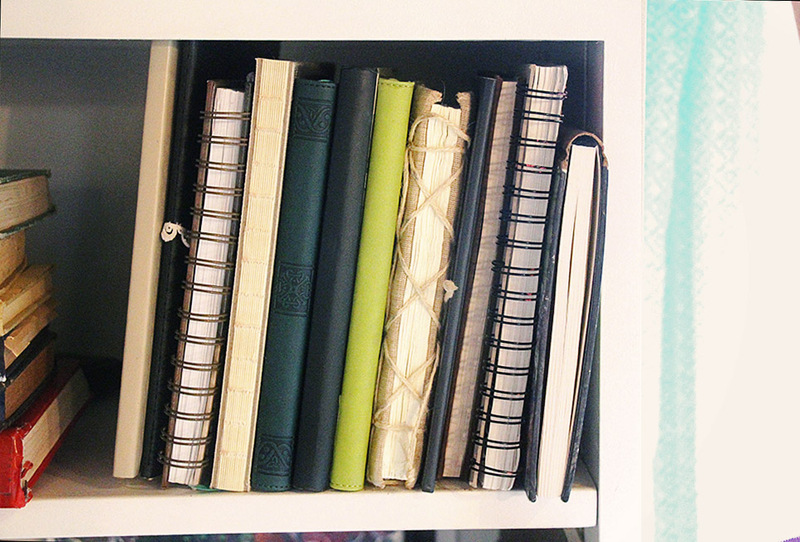 I absolutely adore the look of multiple sketchbooks and art journals all together on a shelf. A collection like this just begs to tell some stories. So there you go! Storing and organizing your art supplies is worth the time! Finding creative ways to organize your art canvases, paper, and sketchbooks can be stylish and useful. These items are key players in what you do as an artist, so let them become part of the show and give them playful roles. 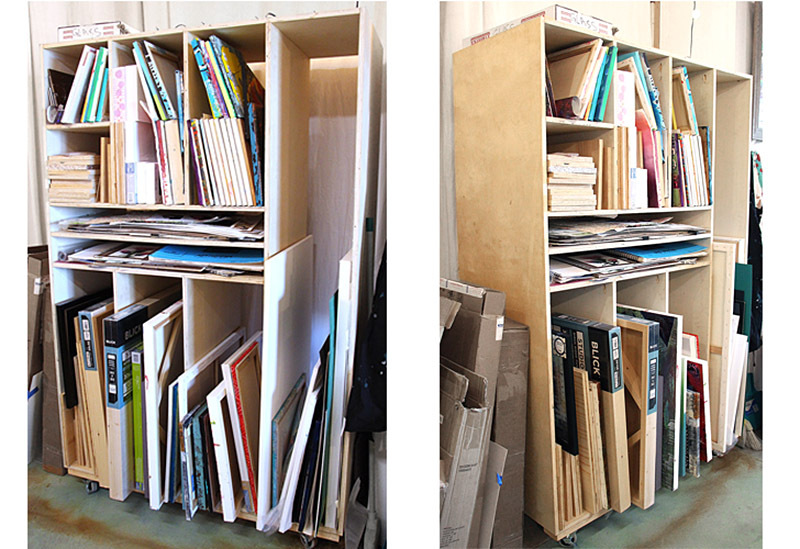 How do you store your canvases, sketchbooks, and art paper? Do you have more suggestions for our readers? Comment below and let us know!